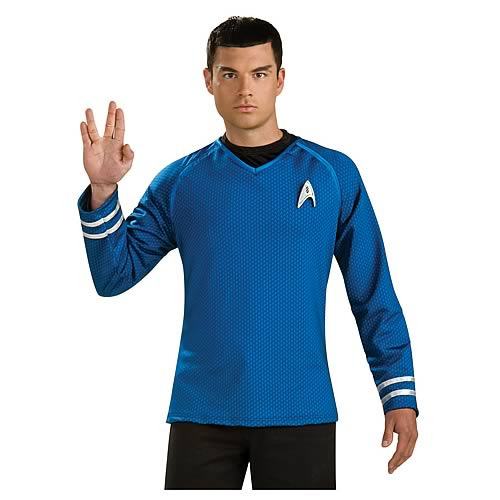 Add this to your Science Officer Spock costume. It's a logical way to express the emotions you feel for Star Trek! It's time to beam up one of these! You've seen the intelligent Mr. Spock in a blue Starfleet uniform for ages. Now order one specially sized for you! This Grand Heritage Spock Blue Shirt features a black Star Trek shirt underneath the blue-colored Star Trek shirt made of heavy Lycra material and sporting a Starfleet pin emblem. Based on designs from the J.J. Abrams Star Trek movie, this hyper-realistic uniform shirt is a logical way to express the emotions you feel for the sciences, the good commander, the Enterprise crew, the blockbuster movie, and the entire Star Trek experience! Available in S, M, L, and XL sizes.